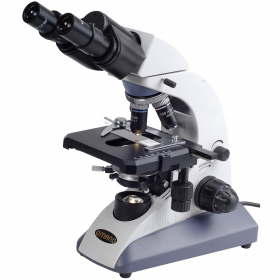 Popular with medical practitioners, the Omano OM88-B is a well-built professional compound microscope with good working optics. Standard features include two sets of eyepieces: WF10x and WF16x (30mm) with oculars that have dual diopters for individual eye focusing. Interpupillary adjustment is 55-75mm. Combined with four, coated, parfocal, parcentered, achromatic objectives (4x, 10x, 40xS, 100xS oil), there are eight magnification settings including: 40x, 64x, 100x, 160x, 400x, 640x, 1,000x and 1,600x. A graduated mechanical stage measures 123mm x 132mm with low position, right-hand drop down coaxial controls. The range of movement is 30mm x 70mm. Integrated incident Illumination is 12V 20W halogen with a 1.25 N. A Abbe condenser, iris diaphragm and filter holder. Rack and pinion focus includes coaxial coarse/fine controls with rack stop to prevent damage. Accessories include spare bulb, fuse, dust cover and manual. Lifetime Limited Warranty. 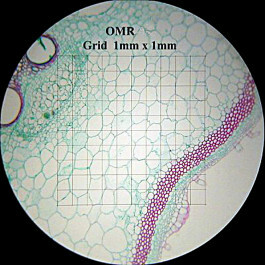 The Omano OM88-T trinocular compound microscope is the trinocular sister to the OM88. It includes a 23mm trinocular adapter for eyepiece cameras. 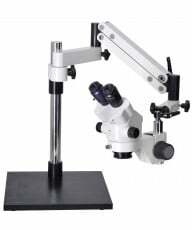 Popular with medical practitioners, it is a well-built professional compound microscope with good working optics. Standard features include two sets of eyepieces: WF10x and WF16x (30mm) with oculars that have dual diopters for individual eye focusing. Combined with four, coated, parfocal, parcentered, achromatic objectives (4x, 10x, 40xS, 100xS oil), there are eight magnification settings including: 40x, 64x, 100x, 160x, 400x, 640x, 1,000x and 1,600x. A graduated mechanical stage measures 123mm x 132mm with low position, right-hand drop down coaxial controls. The range of movement is 30mm x 70mm. Integrated incident Illumination is 12V 20W halogen with a 1.25 N. A Abbe condenser, iris diaphragm and filter holder. Rack and pinion focus includes coaxial coarse/fine controls with rack stop and slip clutch to prevent damage. Accessories include spare bulb, fuse, dust cover and manual. Lifetime Limited Warranty. It has a weather-resistant aluminum alloy frame with reinforced corners and side panels encasing a contoured hard-foam interior. 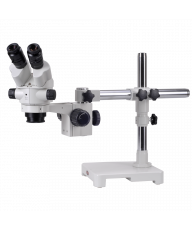 The foam is shaped to fit the Omano OM88 series compound microscope and hold it securely in place, while providing generous cavities and storage areas for accessories, eyepieces, slides and documents. Heavy-duty hinges, locking clasps and a solid carrying handle are designed to withstand the rigors of daily use. 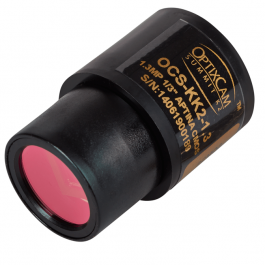 For accurate and convenient microscopic calibration and measurements we offer our 19mm linear reticle specifically for the OM88 compound microscope (16X eyepieces). 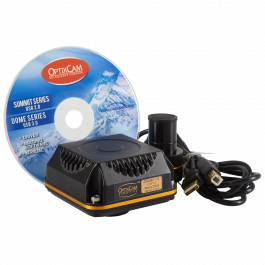 The Omano OM88 Clinical Microscope has been one of our two best selling compound binocular microscopes alongside the OM36 series. 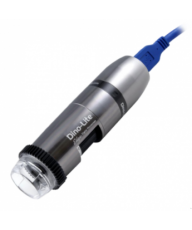 Popular with veterinarians and doctors for both its optics and sturdy design, it has been a workhorse that, in our opinion, offers one of the best value compound microscopes in the Omano range. Both WF10x and WF16x eyepieces are included so that with four objective lenses, the microscope offers eight magnification levels, 40x, 64x, 100x,160x, 400x, 640x, 1,000x and 1,600x. 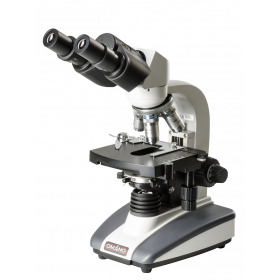 A double-layered mechanical stage, Abbe 1.25 N.A condenser with iris diaphragm and a choice of halogen or LED illumination complete a thoroughly professional microscope. 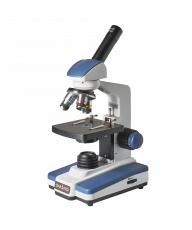 The OM88 includes a Gemel binocular or trinocular microscope head inclined at a more comfortable 30 degrees. The head rotates through 360 degrees for more flexible viewing and includes interpupillary adjustment of 55-75mm as well a dual diopters for individual eye focusing. Four parcentered, parfocal, coated achromatic objectives (4x, 10x, 40x spring, 100x spring, oil immersion) are set in a click stop nosepiece. 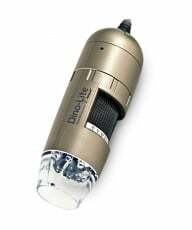 They combine with the two sets of eyepieces to offer eight levels of magnification from 40x-1,600x. Both the 40x and 100x objectives are spring loaded to mitigate the risk of damage on the slide. A large double-layered mechanical stage measures 123mm x132mm and includes spring-loaded slide clamp and dropdown coaxial controls for convenient 'eyes down' operation. The stage X-Y range of movement is 72mm x 32mm. Focusing includes high quality rack and pinion mechanics for longer life and coaxial coarse/fine focus controls for easier focusing. The fine focus scale value is 0.002mm. Safety features include a rack stop to ensure that the stage does not impact with the objectives and thereby break the slides, and a slip clutch control to mitigate the risk of damaging the focus controls through over extension." The condenser is a professional Abbe 1.25 N. A with iris diaphragm and filter for optimal adjustments. Transmitted illumination is 110V 12V 20W halogen or LED with variable intensity. Shipping Wt. and dimensions: 16 Lb. 20"x14"x12". Shipping Wt. 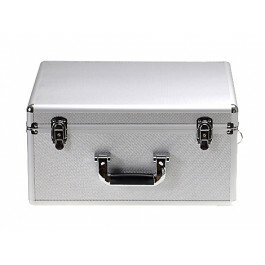 and dimensions with aluminum case: 27 Lb.190"x17"x11".